For more than 20 years, The Web Marketing Association has produced the annual WebAward Competition, the premier annual website award competition that names the best Web sites in 96 industries while setting the standard of excellence for all website development. The WebAward judges have chosen to split out the mobile sites into a separate competition to recognize the explosive growth and creativity in this space. Few award programs recognize the individual achievement behind the creation of today's top web sites the way we do at the Web Marketing Association. We believe it is important to recognize the people and organizations responsible for developing some of the most effective and best web sites on the Internet today. It's a great morale builder. Winning a website award is also an internet marketing opportunity for the award winning web site. Whether you enter this mobile website award to help impress your clients, impress your boss, justify your interactive budget, create an Internet marketing opportunity, or receive valuable feedback regarding the status of your own website development efforts, you will be impressed with how easy it is to enter. When you enter the WebAwards, you also will experience how exciting it can be to win the recognition you deserve! 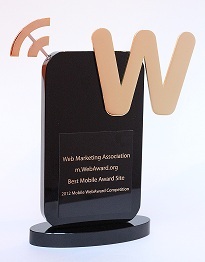 Click here to sign in and enter your website into the 2018 MobileWebAward Competition!